Comic-Con attendees get into the spirit of the convention by dressing up as some of their favorite characters from the world of Science Fiction, Fantasy, Comics, Anime and beyond! 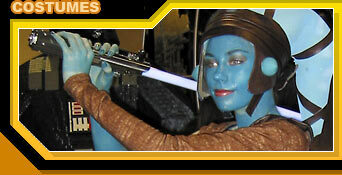 Many of the creations worn in the convention halls were constructed by the costumers themselves. 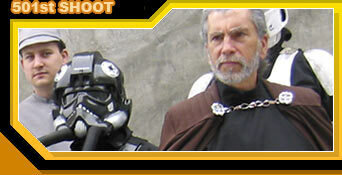 The 501st Legion is the world's definitive Imperial costuming organization. This group of Star Wars "Bad Guys" gathered Saturday morning for a photo shoot on the front steps of the San Diego Convention center with the head of Star Wars Fan Relations, Steve Sansweet. The exhibit hall at the San Diego Convention center spans over 460,000 square feet and features hundreds of vendors selling a wide range of pop-culture merchandise. 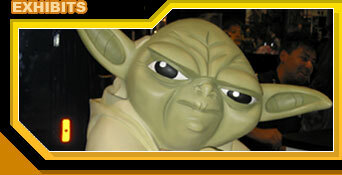 You'll also find booths promoting Hollywood's latest offerings in the world of film and television. 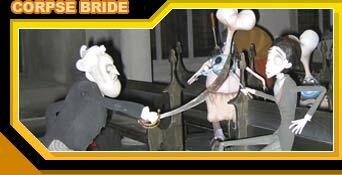 A set from the upcoming Tim Burton movie, The Corpse Bride, was on display at Comic-Con. Convention attendees were able to take a close look at many of the claymation characters used in the making of the movie.